Paris St-Germain clinched their second straight French title after Monaco were held by relegation-threatened Guingamp. Monaco knew they needed to beat their struggling visitors to keep their slim title hopes alive - at least until PSG hosted Rennes later. Dimitar Berbatov briefly rekindled Monaco's faint hopes before Guingamp's Fatih Atik scored a late leveller. PSG would have wrapped up Ligue 1 anyway by beating Rennes, but Monaco's failure brought forward their triumph. 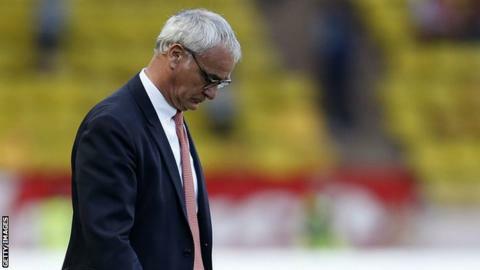 Claudio Ranieri's side are seven points adrift of the Parisians with only two matches remaining. Match ends, Monaco 1, Guingamp 1. Second Half ends, Monaco 1, Guingamp 1. Hand ball by Andrea Raggi (Monaco). Substitution, Monaco. Valère Germain replaces Jérémy Toulalan because of an injury. Delay in match Jérémy Toulalan (Monaco) because of an injury. Mustapha Diallo (Guingamp) is shown the red card. Foul by Mustapha Diallo (Guingamp). Ricardo Carvalho (Monaco) is shown the yellow card for a bad foul. Foul by Ricardo Carvalho (Monaco). Mustapha Diallo (Guingamp) wins a free kick in the defensive half. Goal! Monaco 1, Guingamp 1. Fatih Atik (Guingamp) right footed shot from the centre of the box to the bottom right corner. Assisted by Mustapha Yatabaré. Fatih Atik (Guingamp) wins a free kick in the attacking half. Substitution, Monaco. Lucas Ocampos replaces Dimitar Berbatov. Lionel Mathis (Guingamp) is shown the yellow card for a bad foul. Geoffrey Kondogbia (Monaco) wins a free kick in the defensive half. Foul by Lionel Mathis (Guingamp). Lionel Mathis (Guingamp) wins a free kick in the defensive half. Substitution, Guingamp. Steeven Langil replaces Thibault Giresse. Attempt missed. João Moutinho (Monaco) left footed shot from outside the box misses to the right. Emmanuel Rivière (Monaco) wins a free kick on the right wing. Goal! Monaco 1, Guingamp 0. Dimitar Berbatov (Monaco) header from the centre of the box to the bottom left corner. Assisted by Nabil Dirar. Attempt missed. Elderson (Monaco) header from the centre of the box misses to the right. Assisted by Andrea Raggi with a cross. Attempt missed. James Rodríguez (Monaco) left footed shot from outside the box is close, but misses to the right from a direct free kick. Corner, Monaco. Conceded by Mamadou Samassa. Attempt blocked. Dimitar Berbatov (Monaco) right footed shot from the right side of the box is blocked. Assisted by James Rodríguez. Attempt blocked. Younousse Sankhare (Guingamp) left footed shot from outside the box is blocked. Attempt missed. Andrea Raggi (Monaco) header from the centre of the box is high and wide to the left. Assisted by João Moutinho with a cross following a corner. Corner, Monaco. Conceded by Jérémy Sorbon. Attempt blocked. Aymen Abdennour (Monaco) right footed shot from very close range is blocked. Assisted by João Moutinho with a cross.